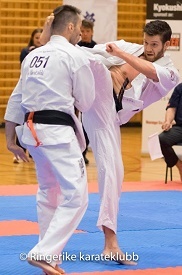 Kyokushin Open are meant to be the international tournament in Norway, and with out doubt – it is! The organizer, Bergen Karate Club (oldest Dojo in Norway) have great experience and the tournament are always going smooth. The hospitality are warm, and the information are also good. Last year Poland, Denmark and Sweden (Ashihara) attended, and they made the tournament raise it`s level. Sweden Shin have also been a important factor to the tournament with fighters and support. 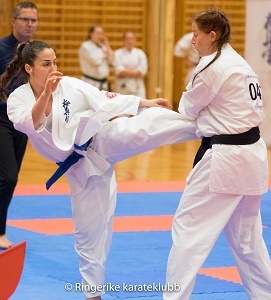 This year Sweden Kyokushin-Kan entered the tournament, so did Makotokai karate Itay, that was creating excitement. Also Shin Hungary was represented, Tamàs Rètfalvi. Shin Sweden had their national tournament the same day so naturally the was supporting that. But one junior fighter was attending, Ki Pasanen, Oyama Karate Kai ⇒ – and she won her category with scoring in every fight! The backside was that Poland and Denmark who fought in the tournament last year, was not coming this year. So instead of increasing, the tournament was about the same number of fighters as last year. so maybe next year, all will participate at the same time! The middleweight category men, was the division that drew most attention. Italy, Sweden, Hungary and Norway was represented in this category, and several good fights was to see. Home fighter ⇐Bjørn Eirik Orstad was the one that took the victory. In the final Tamàs Rètfalvi , Hugary, could not stop the Norwegian fighter, who was clearly the strongest one through the day. Earlier Orstad had a win over Alessando Pancaldi, Italy. Tamàs Rètfalvi on his side, took on Umid Tagaev, Sweden in the first fight, so a win against Alex Manndaglio, Italy before the final.Good fight, but no one could threaten Orstad. Lightweight was thinned down to two fighters, during some drop outs and a little low interest. Norwegian Hans Kristian Havreberg took this title against Francesco Schiavo Italy. The fight was even, and went to a draw, but in the overtime Havreberg wanted it most and secured the victory. Men heavyweight was the same as lightweight men-only two,and this become a Norwegian final. Will and power was the picture, little to much at some times that resulted in unclean hits and the fight missed a little of the technical aspect. Winner Eivind Nærland. The same issue was in women middleweight. And in the final Mette-Marie Nielsen Sweden takes the fight after 3 minutes against Therese Netland Østebrød Norway. Nielsen the runner up in Swedish Open last year, and that in a very strong tournament. Showes why this time also, and the pace are a little to high for the less experience Østebrød. But the Norwegian fighter grows into the fight, and manage to defend well and fight back counter. After ordinary round 2 flag draw – 3 flag Mette-Marie Nielsen. Lightweight women did also have a good line up. Sweden, Italy and Norway was ready to go. Shevin Rubin Urgan, Sweden manage to pass Norwegian fighter Beathe Hegerland, after warnings. Next fight Urgan was the one who lost, and Ilaria Schiavo, Italy anvanced to the final. In the final reign Norwegian Champion Jeanette Johannessen was ready, as she had advanced in the fight she had against Desire Sircelj, Italy. This was a good final, even and with good pace. Johannessen pushing forward, Sircelj moving well and “firing back” All five flags voted for an extra round. Johannessen in to the next round keeping the pressure on, finding the distance for her knees and uses them well. The pace was good, and the audience appreciated fight loudly. 2 flags for draw – 3 flags for Johannessen, and this made her the winner of the category. The tournament was once again very good organized, and the team behind deserve more fighters at next edition! Everyone who attended did a great job and special thanks to Sweden, Italy and Hungary – hope to see you again! Click picture for full results..